(2016). The effect of Silica coating on bioactivity and biodegradability of Hydroxyapatite synthesized in collagen matrix. International Journal of Bio-Inorganic Hybrid Nanomaterials, 5(1), 19-26.
. "The effect of Silica coating on bioactivity and biodegradability of Hydroxyapatite synthesized in collagen matrix". 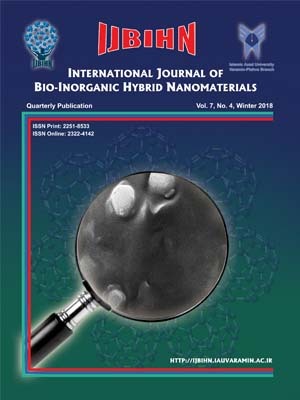 International Journal of Bio-Inorganic Hybrid Nanomaterials, 5, 1, 2016, 19-26. (2016). 'The effect of Silica coating on bioactivity and biodegradability of Hydroxyapatite synthesized in collagen matrix', International Journal of Bio-Inorganic Hybrid Nanomaterials, 5(1), pp. 19-26. The effect of Silica coating on bioactivity and biodegradability of Hydroxyapatite synthesized in collagen matrix. International Journal of Bio-Inorganic Hybrid Nanomaterials, 2016; 5(1): 19-26. The aim of this work was to investigate the effect of silica coating on bioactivity and biodegradability of hydroxyapatite. In this purpose, we firstly attempted to synthesis hydroxyapatite (HA) nanoparticles and its silica coated (Si-HA) sample in collagen matrix using calcium chloride, sodium phosphate and sodium silicate. Characterization of the sample was carried out using Fourier transform infrared spectroscopy (FTIR), Scanning and transmission electron microscopy (SEM & TEM) and XRD patterns. The great decrease in HA’s crystallinity observed in XRD pattern and grain size growth and morphological change of HA in silica coated samples after 72 hrs immersion in SBF solution was attributed to the bioactivity and bio-degradability of HA in silica coated samples.